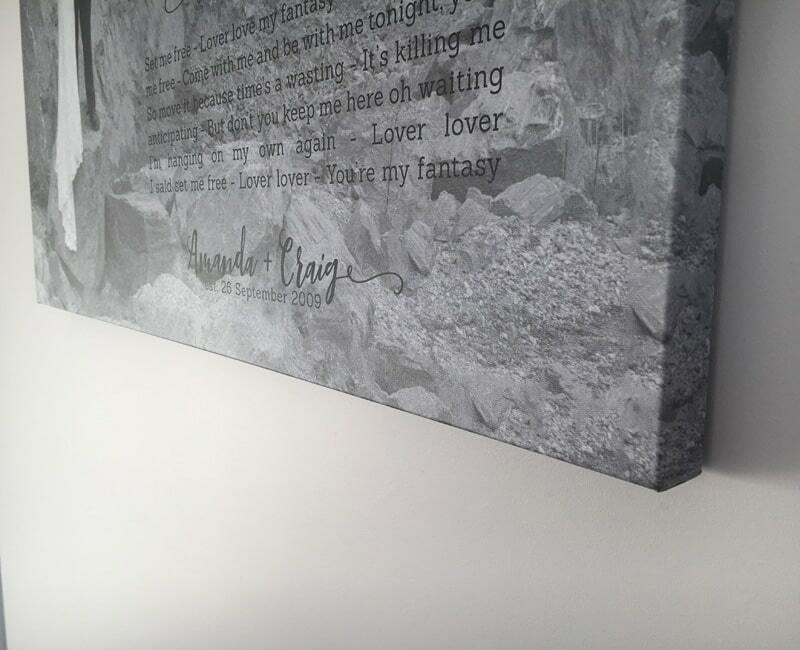 Celebrate your wedding anniversary or simply add a personalised touch to your home’s walls with a piece of art that commemorates your wedding day and text that’s special to you – whether that’s your first dance lyrics, wedding vows or a reading from your wedding day. 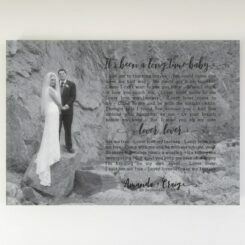 A beautiful wedding photograph and your wedding’s first dance lyrics (or any text you’d like) are transformed into this modern piece of artwork. Selected lines from the text supplied are highlighted, we can pick which lines to embellish, or you can tell us which ones have meaning for you. This personalised print is a lovely wedding anniversary gift for your partner. 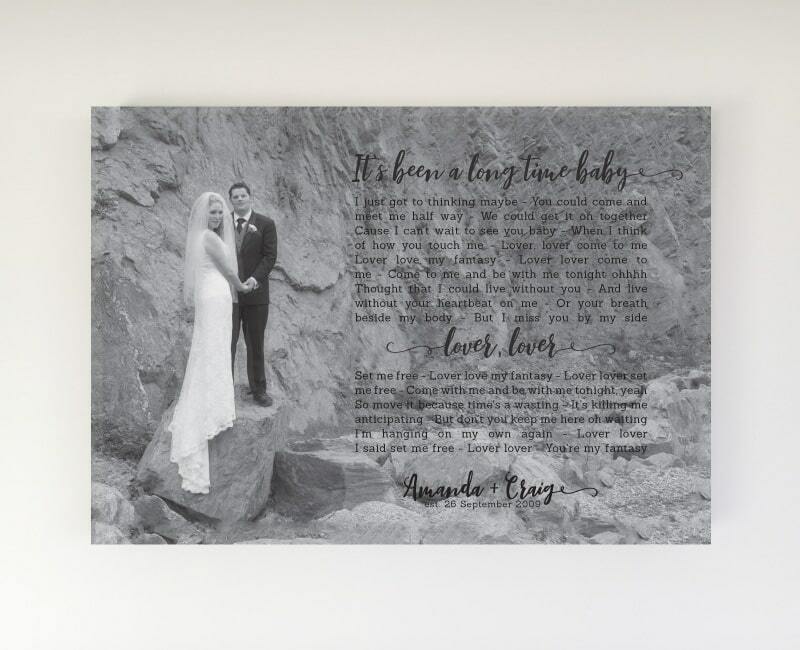 A first wedding anniversary gift of paper, or a second wedding anniversary gift of cotton (canvas print) makes this an apt gift idea for those wishing to follow the “traditional” present ideas for wedding anniversaries. The best style of photo to use is one with the couple standing to the side, with lots of space on either side, so there’s room for the text. It doesn’t need to be black and white – we can convert it for you. But the end result will work best with a photograph that’s a similar composition to the product image. 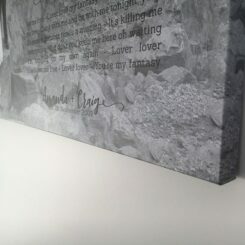 Your final design will be tweaked to accommodate the particular space available on your wedding picture with the text you want included. If you’re pressed for time for a present idea, you’re on a tight budget, or you have access to a high quality printer, then the printable version is perfect for you. 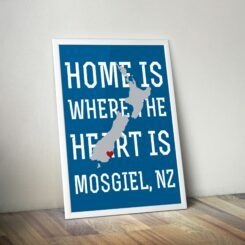 You will receive a high resolution PDF version of this print within a couple of days of your order.